As a child, I had recurring nightmares about a little town a half hour away from my house. It was a charming area, full of art and history, but for some reason, whenever we drove through the century old homes and hairpin roads, the crawlies would follow me home. They stuck their slimy talons into my dreams, twisting them into terrors and woke me up with a thudding heart and a disdain for a very cool looking town. What the heck? In my teen years, I found out it was a hang-out for Satan worshipers. People would laugh and joke about those rebellious kids who just wanted to do something cool and “dark,” by sneaking out at night and performing strange ceremonies. I laughed some too, but quietly remembered the crawlies I felt as a child and knew the skeptics were looking past the root of the issue. What was it? Despite the small town values around me, it was still difficult for an individual to be bold when it came to beliefs of the supernatural realm. If you talked UFO’s too much, you were a weirdo, if you talked Jesus too much, you were a geek. It’s always safer standing in the shoes of skepticism. Still is. According to The Paranormal Conspiracy by Timothy J. Dailey, when veteran UFO researcher Joe Jordan discovered a man had successfully halted an attempted abduction when he used the name of Jesus (bear with me here) he dug into those experiences a little deeper. After contacting researchers around the country, Joe discovered they all had similar stories, but purposely didn’t report them for fear of losing credibility. Now at this point, most people would roll their eyes and throw out names like geek and weirdo, but I think most of us either have our own story or know someone credible who’s had their own experience with the paranormal realm. Maybe with a Ouija board, a spirit guide or a strange lights in the sky. In his book, Dailey talks about the paranormal realm in great length. Of course, we know there are plenty of fakes out there, yes, but inside the web of mystery surrounding the paranormal, there is the real deal. Even the government has their own paranormal researchers. Dailey talks about Bigfoot, aliens and new age philosophies in his book. What frustrates people most about these “sightings” is the lack of tangible evidence, but there are enough experiences by reputable people—people who could easily lose credibility by coming forward—that it’s important to lend a listening ear to this subject. Many people have delved into Spiritualism (that goes by many different names—many celebrities practice some form of Spiritualism) such as Colonel Percy Fawcett. Fawcett undertook an expedition to the Amazonian jungle in 1925 to search for the lost city of Atlantis, or “Z” as he called it. On his last attempt, he disappeared, never to be found again. It was later discovered that he was involved in the occult, and communicated with spirits (aka Watchers or Shining Ones) who gave him detailed instructions on planning his expedition in order to found a new colony, code name “The Great Scheme.” He was to be the leader of this new nation. Obviously, they never came through with their part of the bargain. 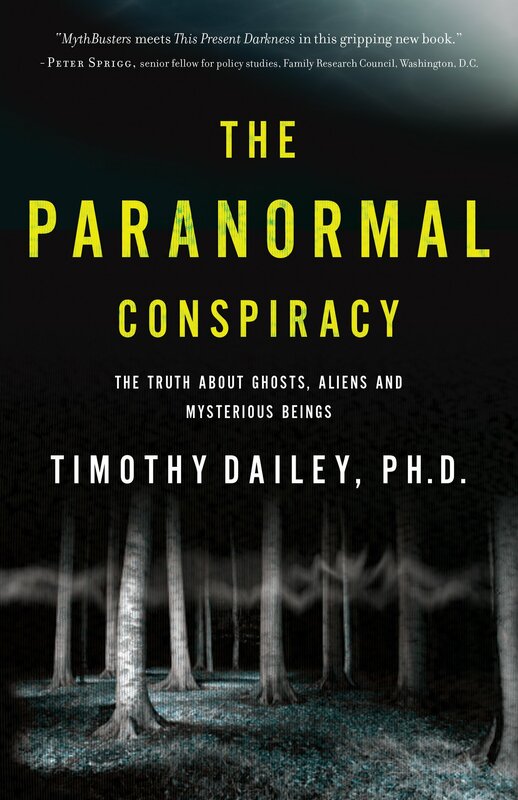 Although a dark read, Dailey did a good job with research and showing the big picture behind the paranormal. The one thing that any spirit behind eastern mysticism, aliens, etc. is that they don’t like hearing the name Jesus. Fear and disdain of His name are always present. If He was just a man, as many say, why would paranormal beings fear Him? I’m just glad I’m on team Jesus. Go ahead, call me a geek. What do you think about the paranormal? Aliens…spirit guides…UFO’s….or plain old demons in disguise? Tell us in the comments. The Paranormal Conspiracy is here.